Do lobbyist’s $$ speak Republicanese? After interminable negative ads, Arizona’s 2018 mid-term elections have mercifully ended, except for a couple of too-close-to-call races that should have already been resolved. In this post, however, the focus is on who the state legislators actually answer to. These are the elected officials closest to the people, representing the 30 statewide legislative districts. Each district elects a state senator and two state representatives who serve two year terms and are term-limited to eight consecutive years in office, with novel ways of skirting those restrictions. They work on Washington Street in Phoenix, not D.C.
For their efforts, the AZ GOP and Brophy McGee got double payback. Not only did they score what they foolishly considered a win in replacing the highly qualified Rep. Maria Syms, but their schemes shamefully worked to elect two Democrats to the state House, in what was once known as a solid red district. Kathy Pappas Petsas went down in flames, coming in dead last of the four running for the LD 28 two House seats. Today’s post provides a literal wealth of information that few voters bother to check. It’s all public information available on the Secretary of State‘s website, and is a primo primer of who our legislators actually answer to — those who fund them. Congressional candidates funding sources are easily available on the Federal Elections Commission website. Since Kathy Pappas Petsas lost, we’ll direct you to her funding sources, who would have done equally well throwing their money down a rat hole. All statewide candidates can be found here. Chances are you might not recognize the lobbyists, but they are rife in her reporting. Which leads us to wonder how a political newcomer develops these insider moneyed connections and what did they expect in return? It’s a given that candidates need money to finance increasingly expensive campaigns. There’s nothing wrong with fundraising which is integral to campaigning. The question is how did fresh out of the political chute Kathy Pappas Petsas establish these contacts and what were their expectations? In a tight race U. S. Rep. Martha McSally (R-CD 2) with 99% of the precincts reporting, has been victorious over radical leftist Kyrsten Sinema as the two battled for the U.S. Senate seat left open when Jeff Flake polled too low to realistically campaign for reelection. Gov. Doug Ducey trounced Democrat David Garcia, who ran on the preposterous issues of raising taxes, doing away with ICE agents and not completing the border wall. The race for AZ Secretary of State, next in line of succession to the governor, has Republican Steve Gaynor comfortably leading Democrat Katie Hobbs. GOP incumbent Attorney General Mark Brnovich maintained an easy edge over January Contreras. Republican Kimberly Yee, a former state senator, leads the Democrat in the state treasurer’s race by over 10 points. She’s a shining star who was tapped to speak at the Republican National Convention in 2016. Frank Riggs, the Republican candidate for Superintendent of Public Instruction, holds a 6,720 vote lead over his Democrat opponent. 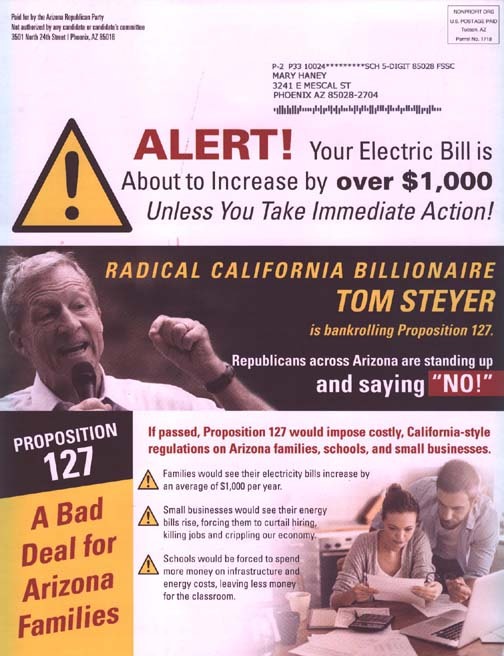 Although the Hillary-endorsing newspaper advised its remaining readers to split the Corporation Commission ticket between one Democrat and one Republican, the advice was disregarded, and both Republicans Justin Olson and Rodney Glassman took the two spots on the utility rate regulating commission. Being behind a smear campaign didn’t help Kate Brophy McGee (R-LD 28). Her devious scheme backfired. She barely squeaked into the state senate, running neck-in-neck with the Democrat. Too slick by half, Brophy McGee’s unconscionable actions, aided and abetted by the AZ GOP hierarchy, resulted in a Democrat win over Maria Syms, the well-qualified conservative House incumbent. McGee’s cohort Kathy Pappas Petsas came in dead last. Arizona now has nine Congressional Districts and the breakdown favors the well-funded Democrats who were boosted by out-of-state financiers, such as liberal activist Tom Steyer, shoveling mega $millions into liberal campaigns. Districts 1, 2, 3, 7 and 9 are now blue, while Rep. Paul Gosar (CD-4), Rep. Andy Biggs (CD-5), Rep. David Schweikert, (CD-6), and Debbie Lesko, (CD-8) held their Republican seats. This election should prove that we can take nothing for granted. The Dems are angry and energized. We can no longer think putting a yard sign in our lawn three weeks before an election is enough. Nationally, with the tireless aid of Pres. Trump, Republicans won Senate seats in Indiana, Missouri and North Dakota to maintain an advantage. The House, however, picked up Dem seats, which will be problematic. Trump’s campaigning on their behalf helped Texas Sen. Ted Cruz and Florida Gov. Ron DeSantis win. Republicans also won the governors’ races in Iowa and the key state of Ohio — a state that is crucial in presidential elections. Pay attention to the missing conservative on the mailers. Somehow incumbent District 28 Legislator Maria Syms is mysteriously absent from the campaign pieces arriving in voter’s mailboxes. Know this: It’s an inside job by the party body snatchers. There are two GOP candidates running for two state House seats in the district. Conservative incumbent Maria Syms, who deserves to be retained, and RINO rabble rouser Kathy Pappas Petsas — known for wanting to “Dekookify” the state GOP in 2012 by clearing out conservatives. Petsas has aligned with former House member Kate Brophy McGee, now running for the state Senate. Both Petsas and McGee are committed abortion proponents, Syms is pro-life. 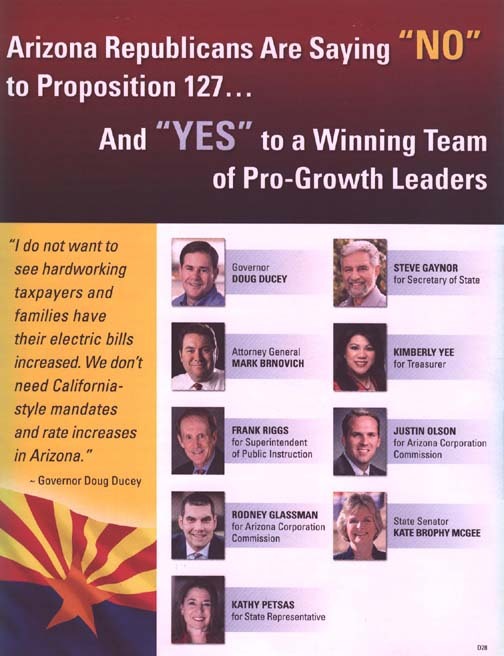 Only candidate Petsas, lacking relevant experience, and her mentor Brophy McGee appear on the mailer. This omission was no oversight. There is a war being waged within the Republican Party, as RINOs consider themselves superior to conservatives in general and President Trump supporters, specifically. Maria Syms’ stellar career includes having served as an Assistant Attorney General, Assistant U.S. Attorney, Paradise Valley Town Councilwoman, and now as a State Representative. She has a proven track record advocating for education, law enforcement, public safety and border security. SRAZ wrote about conservatives being targeted in LD 28 by Kathy Petsas in 2012. When it comes to RINOs, the tune remains the same…it’s just blown on a different harmonica. That basic premise is not one reasonable people thrust aside. Those who fight strenuously for the “right” to kill defenseless babies, are neither reasonable, nor worthy of representing families across the district. Learn more about Representative Maria Syms. She’s the clear choice for voters in Legislative District 28. You are currently browsing the archives for the GOP Legislative Districts category.